Every week, the Counter Extremism Project (CEP) releases a report detailing the way extremists interact online, explaining current trends and how they are misusing the Internet and social media. Today’s edition shows that Anwar al-Awlaki content is still available on YouTube, and that ISIS is using services such as Facebook, Soundcloud and RocketChat to propagate their extremist content online. In November 2017, in response to pressure from CEP, Google-owned YouTube drastically reduced the number of ISIS propaganda videos featuring Anwar al-Awlaki. It was a watershed moment, and the result of years of advocacy by CEP. At that time, YouTube drastically reduced Awlaki’s online presence from 70,000 videos to just 18,600 allegedly using its digital hashing technology. Unfortunately, a new CEP analysis finds that dozens of Awlaki’s lectures are currently still easily locatable on YouTube, amassing tens of thousands of views. Some are months old, while others have been online for nearly a year. They must be removed immediately. 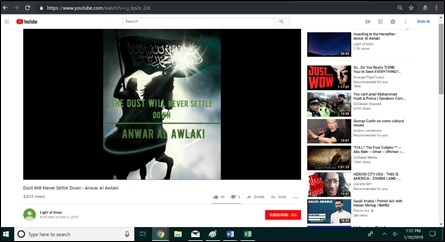 The Anwar al-Awlaki lecture “The Dust Will Never Settle Down” on YouTube. The video has more than 4,600 views and was uploaded to YouTube on December 6, 2018. In the nearly seven years since Awlaki’s death, lectures still found on YouTube, such as “The Dust Will Never Settle Down” have helped inspire dozens of individuals who have committed terrorist attacks or have been convicted in terrorism cases, including Pulse nightclub shooter Omar Mateen, and the Boston Marathon bombers Tamerlan and Dzhokhar Tsarnaev. Previously, CEP had identified at least 89 extremists – 55 from the U.S. and 34 from Europe – with ties to Anwar al-Awlaki. Awlaki’s ideology and lectures continue to influence, propagandize and incite violence, inspiring others around the world via his online materials to join al-Qaeda, al-Shabab and ISIS. ISIS online supporters are using Facebook’s “Watch Party” feature to stream propaganda videos. 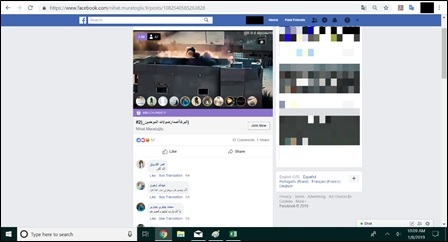 On January 8, 2019, a pro-ISIS Facebook account broadcasted the video “Assaults of the Monotheists,” originally released on October 23, 2018. Seven minutes into the stream, the video had 57 likes/reactions, 31 comments and 37 live viewers. The account that posted the video was deleted approximately two hours later. 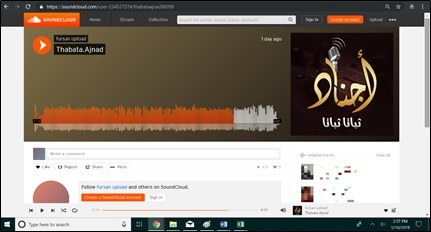 A new ISIS nasheed was uploaded to several websites on January 8, 2019. Titled “Steadfastness, Steadfastness,” the nasheed urges the continuation of the fight and was uploaded as either an mp3 or a static video to at least 19 websites in addition to Telegram: Instaud.io, Google Drive, Google Photos, the Internet Archive, Ustream, the Microsoft One Drive, mail.ru, file.fm, top4top.net, nofile.io, pc.cd, Sendvid, Soundcloud, Streamable, Dropbox, Mediafire, Vidio, Megaupload and Tune.pk. Approximately one to two days later, the nasheed was still available on eight websites: Google Drive, Soundcloud, the Internet Archive, Ustream, top4top.net, Instaud.io, Mediafire, and Tune.pk. ISIS’s online supporters are using the RocketChat communications program to spread propaganda and encourage lone actor attacks. In December 2018, unknown individuals created TechHaven, a chat program built on the RocketChat application. In a user’s guide, TechHaven claims to provide “an open forum for discussion, digital privacy and innovation to oppressed users in conflict zones who are targeted for their beliefs by the authoritarian regimes of the West.” It is unclear if TechHaven has users who do not support ISIS. 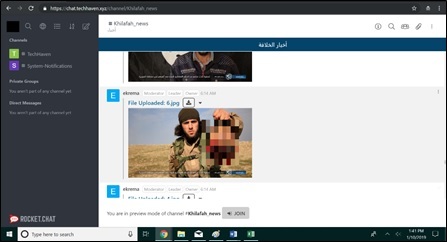 Examples of content found on TechHaven include ISIS Amaq news updates, ISIS videos, and calls to commit terrorist attacks taken directly from ISIS propaganda.